Though incentive business is a long way off from what it was prior to the recession, there are some bright spots, say industry experts. At Starwood Hotels & Resorts, for example, Christie Hicks, senior vice president of global sales, notes a significant pickup -- 40 percent from a year ago -- in bookings and new leads, mainly from firms that had canceled their programs in 2009-'10 and now are rebooking for 2011-'13. And Southborough, Mass.-based incentive firm Globoforce reports a recent influx in requests for proposal from existing clients as well as a 15 percent increase in overall business in the past six months. At the same time, some new client bases are emerging. Hicks says that among new incentive customers at Starwood properties are small, privately held companies in manufacturing and other industries. 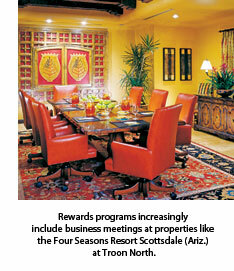 At the Four Seasons Resort Scottsdale at Troon North, incentive business from national sports teams is a new trend, as football, baseball and basketball teams endeavor to reward the firms and individuals who buy their private suites at stadiums and arenas. A year ago, the state of incentives in the United States could best be described as fragile. Planners and suppliers were unsure how programs and the incentive industry as a whole would fare in the wake of a political backlash and budget cutbacks that led to the postponement or cancellation of an estimated 30 percent of programs for 2009-2010. Today, the signs are more promising, as many firms that used these business tools in the past reinstated them this year. At Fenton, Mo.-based Maritz Travel, for example, 75 percent of incentive business from established clients has returned, with most bookings taking place in the past four months. Across the industry, however, the business and the programs are not back to pre-2008 standards. Spending is down, components have been trimmed, and the events themselves are more relevant in tone and purpose than pre-AIG reward trips were. "A new model is evolving," says Brenda Anderson, CEO of Site, the Chicago-based incentive association. "People still need to get together, but the structure and purpose of motivational events are still works in progress." Following, incentive planners and other industry pros share key trends and insights on programs and the incentive business today. Adding meetings One significant change: Incentive firms are incorporating business sessions or meetings into the agenda. Executives at both Chicago-based BCD Meetings & Incentives and the U.K.-based Grass Roots Group say 90 percent of their programs now include a meeting component. Of the programs Maritz arranges, 50 to 60 percent incorporate meetings, according to Chris Gaia, vice president, marketing. Gaia notes that firms increasingly want to take advantage of incentives to get feedback on products and initiatives, as well as to solicit ideas from top performers. The uptick in training sessions and product education during incentives means looking at destinations and facilities with an eye toward meeting space and business facilities, says Kari Vrba, business planning and industry relations, engagement and events, for Minneapolis-based Carlson Marketing. As Mary MacGregor, vice president, business development, for BCD notes, "Traditionally, incentive programs needed function space for a ‘meet and greet' area and meals; now they need it as a place for folks to gather in a business setting." "In the old days, incentive planners skipped the ballroom during site inspections, other than to see if it would work if an event had to be moved indoors if it rained," says Dave Akin, director of marketing at the Four Seasons Resort Scottsdale at Troon North. "Now, planners are paying much more attention to things like hang points and A/V capacities." Being more charitable Community service and charitable activities became more of a presence in programs in early 2009, to help deflect the negative publicity surrounding corporate excess as well as to reflect the urgent needs borne of a serious recession. A year later, such elements are a staple of many reward trips. At Carlson, about one-third of programs incorporate a corporate social responsibility project, while Maritz estimates that figure at 10 to 15 percent. Other third parties, such as team-building firms and destination management companies, also note the trend. Alan Ranzer, executive director of Impact 4 Good, a Bethesda, Md.-based outfit that specializes in CSR events, says his business for the incentives market is up 30 percent over last year. CSR can mean anything from providing food to needy communities to creating and stocking a library for youth centers (see M&C,"Sweet Charity," July 2009, for other examples, or go online to bit.ly/c4NBcG). Staying closer to home According to a January survey conducted by the Incentive Research Foundation, nearly half (47 percent) of respondents who plan international incentive trips anticipated a switch from international to domestic destinations in 2010. "We're still seeing most incentive business for this year within North America," says John Meissner, executive director, corporate markets, for Fairmont Hotels & Resorts, who adds that Scottsdale, Ariz., and Hawaii are particularly popular destinations for reward travel. Christie Hicks, senior vice president, global sales, for Starwood Hotels & Resorts Worldwide, sees the trend stretching even further into the future. "For 2011 and 2012, it's still North America [for incentive programs]. Europe is being looked at for longer-term." "The cost of air travel is really driving decisions more so than ever before," says BCD's MacGregor. She also notes that planners continue to view splashy destinations and high-end luxury properties cautiously. Interestingly, her firm has noticed a 25 percent increase in potential business for all-inclusive properties.